The Canada data showed retail sales a little lower than expectations, the BOC business outlook survey lower in the 4Q vs the 3Q. GDP was near expectations. Crude oil did move lower earlier but is now trading up on the day (at $46.10, up $0.22%. The low reached $45.13). For the USDCAD, the weaker CAD (higher USDCAD) continues its run higher. Looking at the daily chart below, the price is now up for the 7th day in a row. That move has taken the price from 1.3321 to 1.3583 currently. We trade right at the high. 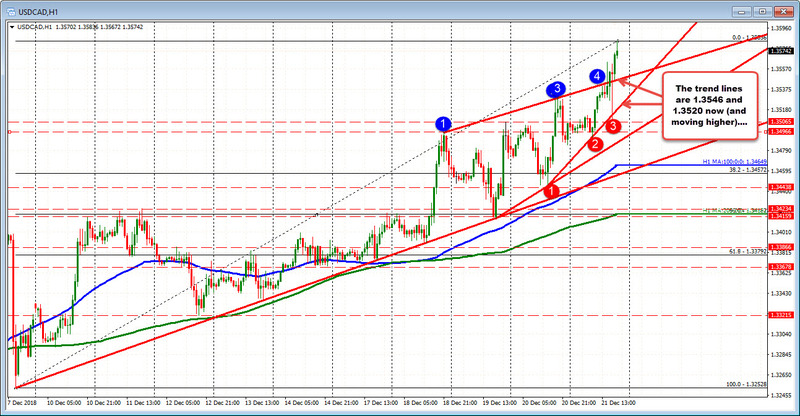 The move today on the daily has taken the price above a trend line at 1.35428 (and moving higher). Stay above, keeps the bulls in control. Drilling to the hourly chart below, the 1.3546 (and moving higher) is a close topside trend line broken today. Below that the NA session dip stalled near a lower trend line at 1.4520. 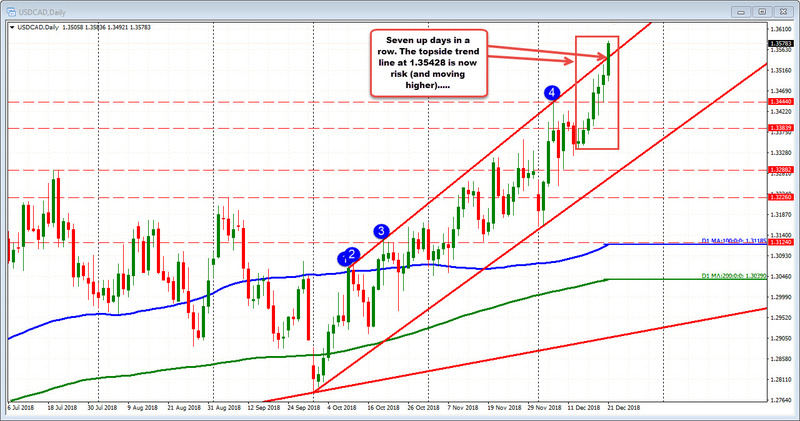 Those levels - coupled with the trend line on the daily at 1.35428, will be eyed for bias clues. Move below, and the run higher may take a pause. For now though, the bulls roar - or snort really loud - and remain in control.